In September of 1760, Governor Vaudreuil negotiated a surrender with General Amherst. Amherst granted Vaudreuil's request that any French residents who chose to remain in the colony would be given freedom to continue worshiping in their Roman Catholic tradition, continued ownership of their property, and the right to remain undisturbed in their homes. The British provided medical treatment for the sick and wounded French soldiers and French regular troops were returned to France aboard British ships with an agreement that they were not to serve again in the present war. 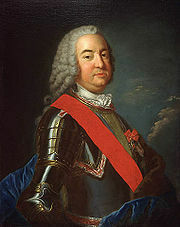 Pierre François de Rigaud, Marquis de Vaudreuil-Cavagnal (22 November 1698 – 4 August 1778) was a Canadian-born French colonial governor in North America. He was governor of French Louisiana (1743-1753) and in 1755 became the last governor of New France (or Canada), during the period when the British conquered it in the Seven Years' War (known in the United States as the French and Indian War).